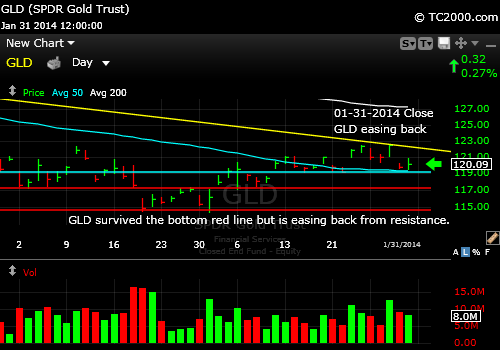 The resistance line I pointed out last Sunday in fact held gold (GLD) back. Gold failed to respond to rates falling further this past week, easing back on Thursday and Friday. Support must hold, even if tested, at 119.11. Until then, the rally is still intact. Gold fails to rally on rates falling toward the end of the week. This entry was posted in gold, investment, metals and tagged gld, gold etf, market timing. Bookmark the permalink.